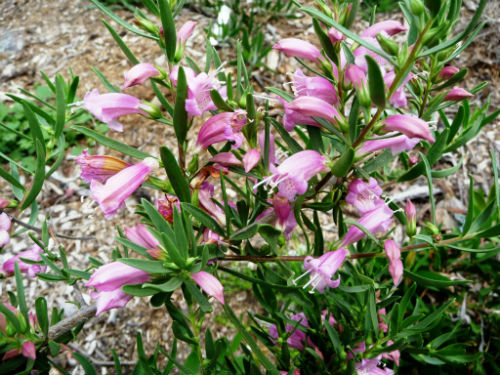 Eremophila laanii is a medium to tall shrub that may reach a height of four metres. Leaves have a succulent feel and are narrow, flat with a pointed tip. Flowers are white, cream or pink and two centimetres long. They are conspicious and extremely profuse during the flowering period which extends from August to January. Sporadic flowering may occur at other times. Honeyeaters are attracted to the blooms. Occasional pruning is both appreciated and necessary to prevent plants becoming straggly. The white-flowered form may respond to pruning by suckering. E. laanii could be grown to screen out fences and other structures in the garden. This colourful emu bush is happy growing in well-drained situations but will also cope with runoff and overflow from a tank. E. laanii is found in the upper reaches of the Gascoyne and Murchison River system, Western Australia. There is also an isolated occurrence near Carnarvon, also in Western Australia. 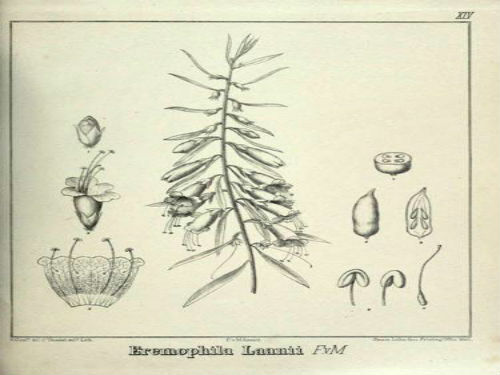 The type was collected on the upper reaches of the Murchison River, near Mt. Hale, WA. The species was named in 1884 by Baron von Mueller. The lower image is the original drawing by von Mueller. The species name honours Dr. van der Laan, a 19th century physician and promoter of scientific research.